I bet when you all think of having a "spa day" you would never think having one at a tanning bed, right ? Yeah I wouldn't either, until now. Hot Spot Tanning has always been my go to place if I ever need a last minute spray tan and where I have gone in the past years, when I tanned regularly. Their locations are convenient because just about anywhere I've ever lived (yes, I'm a gypsy) there always seems to be a location nearby. There are several in Murfreesboro(Memorial, Rutherford Blvd, Church Street, Rucker Lane) some in Smyrna (Almaville & Sam Ridley), even a Brentwood( Nolensville Road) and a Nashville( West End) location. With my busy schedule, convenience is key! I was lucky enough to get to try each of the new spa services yesterday & let me tell you, when I left, I felt ahhhh-mazing! Before I begin telling y'all about my experience with each of the spa services, I want to talk a little about the atmosphere of their location on Memorial Blvd. beside the Murfreesboro Athletic Club or the MAC. This is their Hot Spa location but some of these services are offered at other locations too. When you walk in, other than there being tanning lotion for sale behind the front desk, it doesn't have a tanning bed feeling at all. Most tanning beds I've ever been to have been very bright and almost tropical feeling but this was very soothing. Calming colors and the smell of essential oils were in the air. I felt more relaxed as soon as I walked in the door. This blue light therapy is Dermatologist recommended for people of any age with current acne breakouts or red spots. It uses medical grade blue LED lights to kill bacteria that causes spots and helps to prevent new breakouts, regulates oil production , calms and relaxes you as well as minimizing any scarring you may have on your face. I don't usually get breakouts too often but I tried this one so I could tell you all what it's like. When you see the mask and put it on it looks like something out of a Black Eyed Peas video. It was really futuristic and almost astronaut helmet feeling, but very lightweight. They place it over your head and you sit in a massaging chair the entire time (20 minutes) , you even get to put your legs up and they get massaged too. Very relaxing to say the least. The room was also very comfortable, smells great and they even offered me a spa robe and shoes. When I think about light therapy of any kind I would almost expect that it would hurt but it was completely painless and when I took the mask off it only made my face feel a little tingley and good. My favorite part was sending my friends snapchats, looking crazy. None of them probably even realize it wasn't one of those crazy snapchat filters until now. This service is $20 a visit. Anyone who is looking to slow down the aging process, correcting current aging effects such as minimizing the appearance of fine lines, wrinkles and blemishes , evening out pigmentation or someone who wants a painless, non-invasive anti-aging regimen; this is for you. The Lumiere is a twenty minute treatment and again completely painless. You sit in the same massaging chair as in the blue light therapy. You wear goggles and when they initially turn on the red light it's very bright, even with your eyes closed, but don't worry it goes away after about ten seconds so don't let it freak you out. 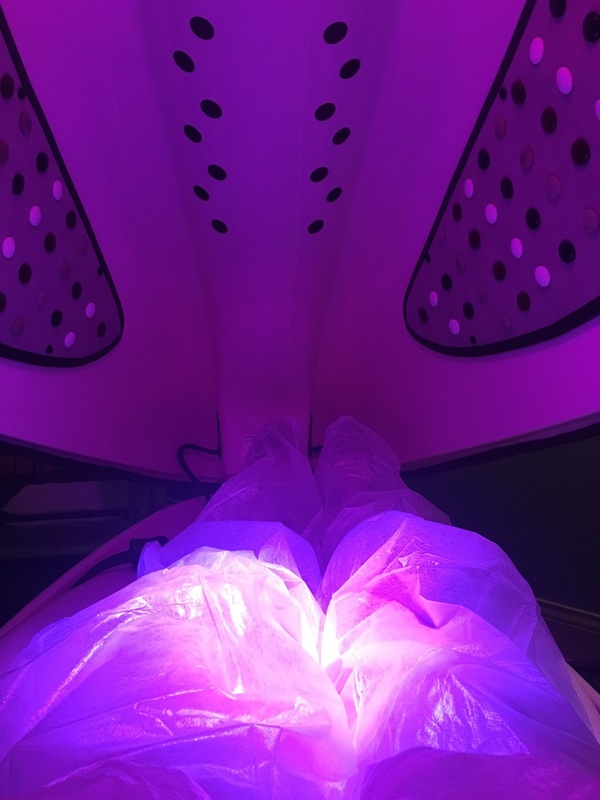 This treatment uses red light LED therapy to restore radiance back into the skin, detoxifies, stimulates collagen synthesis and can even smooth out dry or rough skin. The red light therapy is able to penetrate deeper than just the surface. I really loved this treatment! I somehow have the wrinkles of a 90 year old so I will be back. This service is $20 per visit and they can discuss with you how many you may need. The first thing I will say about this machine is that you stand on it for just 10 minutes and it's the equivalent of doing 30 minutes of cardio. How can you can really beat that? I personally hate doing cardio so I was sold !! It's perfect for anyone who has a very limited amount of time to work out or someone who has physical limitations to workouts at the gym. It has vibrating plates that help with arthritis relief, restoration of balance, strengthening bone, weight management, blood sugar balance, sleep improvement and a healthier heart. You will most likely feel silly on this machine, but you will definitely feel the effects when you get off! This is $10 a visit. 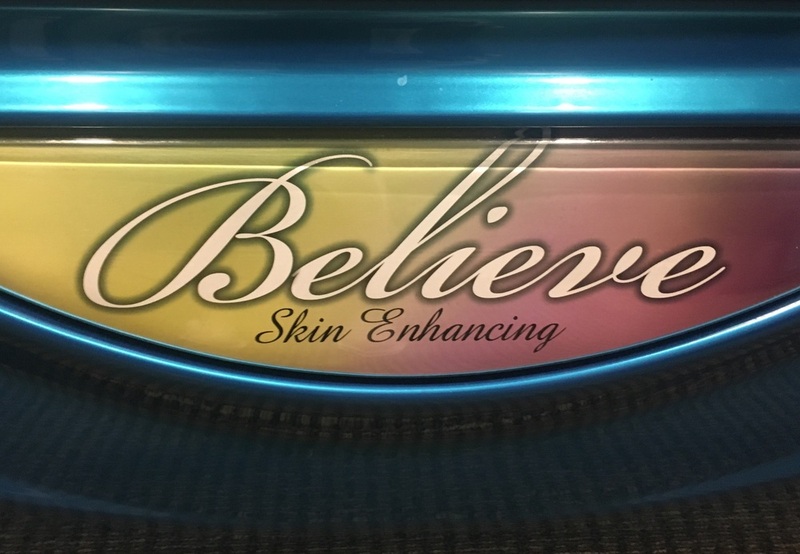 The Believe bed is perfect for anyone wanting to add hydration back into the skin, relax muscles or improve scarring and uneven skin tones. This one looks like a tanning bed but it's actually your whole body getting the benefits of the red light therapy. This is more of an over all skin ehancing machine! I have some scars I want to get rid of so that was the most exciting part of this to me. It can fade scars or stretch marks and can reduce spider veins or broken capillaries. This also provides several benefits for people with injuries or pain by reducing inflammation and pain, increasing circulation, restoring range of motion and can speed up the healing of wounds. Only takes 15 minutes and $10 a session. Cocoon Wellness Pod "The Pod"
I don't know if there are enough good words to say about this one ! I've never experienced anything like it or felt so good as I did when I got out. This would be great for anyone who wants a quick way to relax, relieve pain or muscle tension. This detoxifies the body, alleviates stress, helps with water retention , bloating and even cramps !! It combines heat, massage and magnetic fields to create a SUPER relaxing, healing environment. You put on a sweat suit (this will make you feel like you're in a Missy Elliot music video from the 90's), which is extremely comfortable, then lay in a bed which your body will absolutely melt into. It is almost like being in sauna, without the almost suffocating feel that comes with it because your head remains outside of the heat. 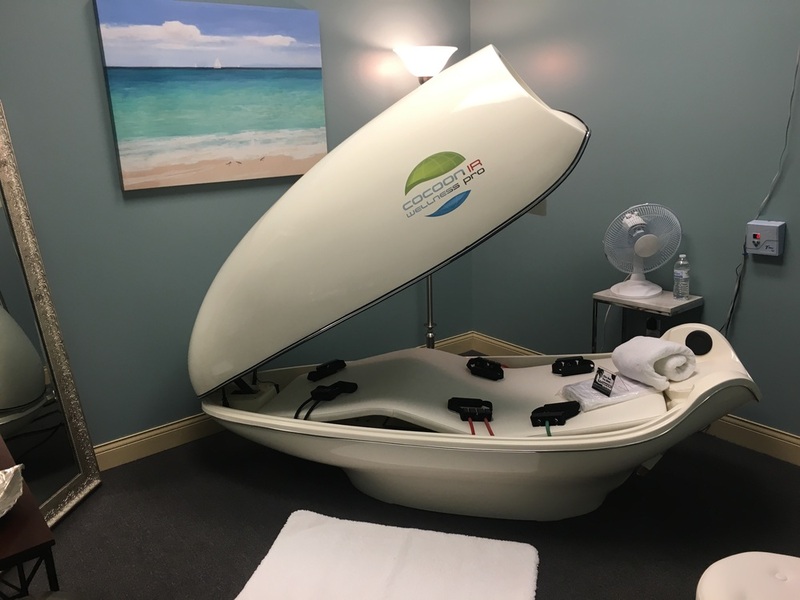 Your neck and down will only be inside the cocoon and you are able to adjust the intensity of the massage speed and intensity on both your upper and lower body. There are even little holes that your hands come through if you need to make any adjustments. Being in "the Pod" you will burn up to 300 calories in just 30 minutes. The temperature inside by the time you will be done with your session gets up to 170 degrees, which sounds crazy but it's abslutely refreshing. If you ever get too hot you are able to get I don't think I have ever sweated that much in my entire life. I normally don't like to sweat at all but I guess there's a first time for everything. I think I fell asleep a couple times, which I think most people do in there, and when I left there I felt better than I do after getting an hour massage that I pay between seventy to one hundred dollars for! When you get out you will want to drink plenty of water(room temperature so that your body doesn't go into shock) which The Hot Spa provides you. There will be a towel to dry off your body, a cool wet towel for your face, spray deodorant and body spray so that you can freshen up. This was actually heavenly and really helped out with my super sore muscles from working out. I've had a pretty crazy week and it was just what I needed. I highly recommend this! A session is just $35. This system is good for anyone with trouble fatty areas, anyone who would like to get a jump start on weight loss, has cellulite, needs skin tightening or diminishing stretch marks. This LED system is designed to contour the body by losing inches off specific body areas such as the waist, hips, thighs, arms and neck. You go to a series of visits to see a change but typically people will lose 2-4 pant or dress sizes in just 42 days. The LED alters the fat in the cells and allows it to seep out from the cell into space where it can be processed by the lymphatic system. The fat is either used by the body as energy or the body will process it out. They place 8 pads on your choice of troubled fatty area ( I chose my stomach to try) for 7 minute treatments, so this is very quick. I felt absolutely no pain at all, only little tiny pulsing. When I heard about this originally I was also expecting it to hurt but nothing at all me feel the least bit uncomfortable. Today's post is more like a dear diary post than anything else, and I think that's ok. I made some MAJOR life changes today. I literally quit my job, got another one, and applied to college. I also worked out which was also a major life change, because simply walking up the steps to my apartment is the extent of my athleticism. Seriously embarrassing but it feels as if I just ran a marathon every time I get to the top. Life is so strange sometimes. It only took me almost 30 years but I think I finally figured it out. I've never felt like a "normal" person. I was the kid watching "I Love Lucy" or "Bewitched" instead of cartoons, and what felt like the only high school kid in my senior class who couldn't pick a major. I've done it all, went to MTSU straight out of high school but that didn't last long. Cosmetology school right after that. Unfortunately I'm a perfectionist and it once took me two hours to do a haircut, I never would have made it. Real Estate school. Literally done it all. I've been at a job for quite some time that quite frankly did not make me truly happy. I would go to work everyday and the more time that would pass by I realized there is something more out there for me, and that was not what I wanted to do my entire life. The more time that went by the more things started happening that made me realize what I actually want to do. I also got the best advice from a friend "If you don't like where you are- MOVE, you aren't a tree" and I can be the first to tell you, it's some of the best advice I've ever gotten ( thanks Brianna). It all started out when I had a nose bleed so bad that I lost 1/4 of my body's blood(sorry graphics), it lasted about four hours and nothing could make it stop other than three doctors, two trips to the emergency room in 24 hours and two nights staying at the hospital. The first thing that I realized here was how the blood did not gross me out at all whatsoever. I can handle that. The second thing was the fact that out of the ten nurses I encountered, only about 3 of them were actually nice to me or seemed like they cared. I thought to myself, this is crazy, if this was the other way around I would be way more passionate about taking care of this person. I've always been a very caring person in general. Most times, almost too caring, which can either be a blessing or a curse. I feel like most times it's a curse but it is what it is. I think I get that from my mom (thanks Sue). Another thing that sort of changed my life is when I sat next to a blind woman named Terry on an airplane while traveling last month to Denver. I will never forget her, she was such a sweet woman. She made me appreciate things a whole lot more. She openly talked to me about being blind since birth. The statement that touched my heart the most was when she said "it doesn't really bother me, I don't know any other way, but I wonder if an apple looks like an apple feels". We then talked about how she doesn't even know what red looks like, she's never seen it. I can't even imagine that. She was still such a happy person. I found myself talking to her and helping her out with everything she needed the entire flight. It made me feel genuinely happy and good inside to know I was taking good care of her. I've always loved any possible way to make a difference in someone's life & I can't think of a better way for me personally than to become a nurse. At the end of my flight Terry told me that I would make the best nurse. That felt really good. I've been wanting to go back to school for awhile, like I said the more days that would go by being unhappy and settling made me want it that much more. There would have been no possible way for me to go back to school working where I was. I took a leap of faith and realized life is too short, if you want to do something no one is stopping you! You are in charge of your own happiness. I wasn't going to be miserable any longer. I'm actually switching to another job where I will likely be making a lot less money but I've realized lately that money truly really does not buy you happiness. I understand money can buy you all kinds of things, but true happiness comes from within. I figured my family would be upset with me so I avoided telling them right away. Most found of from my facebook status but I was shocked when the first comment was from my dad. The first thing he said was "YOLO" , not kidding. He then followed it up with this: "Sometimes a bold move is what it takes to find happiness. I am proud you are courageous and ambitious!!! Most miserable people SETTLE!! They spend life miserable and at an old age, look back with regret!! I love you and we are proud of you!! I got your back Doll!!" You guys have no idea how much this comment meant to me coming from him. I don't want to look back with regrets! I want to make myself happy and make myself and my family proud. These next few years are likely going to be a struggle. Financially, mentally and probably physically but I have no doubt in my mind I finally "know what I want to be when I grow up." It sounds crazy and almost weird to me to be so behind in life compared to others but I guess it's never too late. Change can be very scary but so can walking out your front door these days. If you have been thinking about making a change to better any aspect in your life ask yourself like I did "What are you waiting for?. Hold your vision and trust the process!! Life is too short to not be ridiculously obsessed with yours. It was the best day ever, and I couldn't be happier because I am taking a chance and making a change. Thank you for reading, friends and for all my friends and family being so supportive of my decision, I really appreciate you!